Former Crawley Town and Arsenal forward Sanchez Watt was shown a red card in a hilarious dissent mix up when playing for Hemel Hempstead Town on Tuesday night. 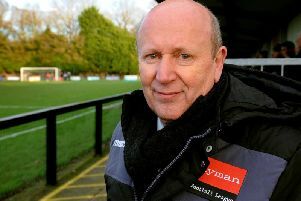 The ex-Leeds United and Sheffield Wednesday loan player became embroiled in a referee gaffe during a National League South game with East Thurrock United. Watt was called over by official Dean Hulme after kicking the ball away and was asked for his name so he could be cautioned. The 27-year-old, who made 18 appearances for Crawley in two spells, replied with ‘Watt’, but the referee took this as a sarcastic ‘what’ and after confusion reigned with the same replies back and forth, Hulme brandished a red card. The incident was then explained to the referee and the red card was rescinded and Watt was allowed to remain on the pitch. Hemel tweeted at the time: “Red card: Sanchez Watt is sent off, presumably for dissent. “And all of sudden the colour of the card changes to yellow. A rather bizarre incident all stemming from the decision to award Thurrock a goal-kick despite a clear touch from a defender before the ball went out. Watt, who is on loan from big-spending Billericay Town, had early scored for his side as they went on to secure a 2-0 victory. The attacker first signed for Crawley in 2012 on a loan deal from Arsenal, having previously spent time at Leeds United and Sheffield Wednesday. He then re-signed for Reds in 2016 after a successful trial under the late Dermot Drummy, but found his chances limited and was later released.